Site-specific oral relative bioavailability (RBA) of arsenic in soil was determined to inform risk-based decision making at a former U.S. Air Force installation in California. 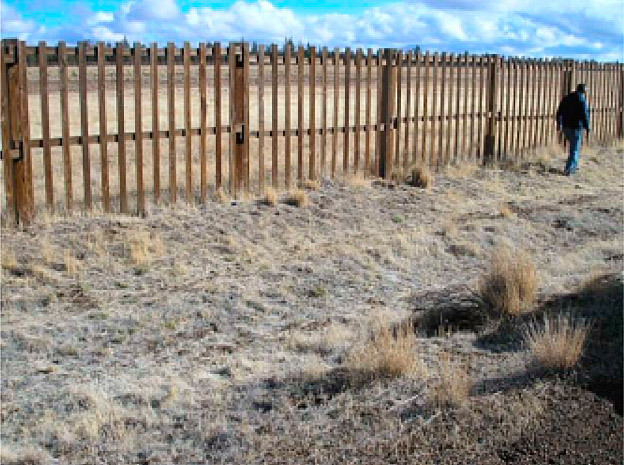 During the 1980s, treated wood fencing was installed around the site perimeter for several miles (Figure 11-10). Soluble arsenic from copper chromated arsenate (CCA) used in wood treatment has since leached and accumulated along the drip-line beneath the fence. Resulting concentrations in soil are as high as 940 mg/kg total arsenic, in comparison to individual background concentrations in the range of approximately 0.91 to 3.53 mg/kg. Arsenic is the primary risk for human health, and is associated with the incidental ingestion of soil. Removing the arsenic to background levels along the entire fence perimeter, however, is cost prohibitive. The site is approximately 927 acres and consists of three sectors, Sectors 4, 5, and 6. The U.S. Forest Service (USFS) is the designated federal land management agency. Consequently, U.S. Department of Agriculture (USDA) and USFS regulations and policy govern current and future land use of the property. The area surrounding the sectors has been sparsely forested and, for the past 40 years, has been used for livestock grazing and harvesting of forest products. The fencing surrounding the three sectors is 59,075 linear feet (approximately 11 miles). The fencing and fence posts are classified as treated wood waste (TWW) and are planned for removal. This waste stream must be handled in accordance with the California Code of Regulations Title 22, division 4.5, Chapter 34, Alternative Management Standards (AMS) for Treated Wood Waste. The AMS recognizes that TWW contains hazardous levels of chemicals such as arsenic, copper, and zinc. Discrete, composite and multi-incremental samples (MIS) samples of surface and subsurface soil were collected around 24 fence posts (eight posts per sector), under the fence posts (by digging out the posts) and analyzed for metals and SVOCs. The samples were collected around the corners of each post because the post footing concrete typically had large cracks that would likely result in a preferred contaminant migration pathway from the post to underlying soil. Soil sampling was conducted following the ITRC (2012) guidance for incremental sampling methodology. Linear decision units (DUs) were defined as approximately 100 foot lengths of fence, separated into interior and exterior portions on either side of the fence and extended laterally about 3.5 to 6 feet from the fence and vertically to depths of 1 ft. ISM was completed using a systematic random sampling approach. Each end of the DU boundaries were measured and recorded in the field using a handheld global positioning system (GPS) unit with submeter accuracy. The boundaries of each DU were marked before sampling. The linear DUs were typically staked with string to maintain the sampling line while drilling. All data (discrete, composite and MIS) were used for the risk assessment. Statistical estimates of background arsenic values in site soils were MIS (95UCL) = 1.33 mg/kg and Discrete (UTL95-95) = 1.89 mg/kg were selected after a review of upper-bound statistical estimates that ranged from 1.33 mg/kg to 3.8 mg/kg, corresponding to a variety of soil types, soil depths and statistical methods. For six individual sites (focusing only on the three fence sites as sources of CCA), the total concentrations ranged from 0.96 to 957 mg/kg while the 95% UCL of the mean calculated for each location ranged from 27 mg/kg up to 478 mg/kg. Table 11-6 includes the arsenic concentrations in soil. Soils on the site are red and high in iron oxides. General soil properties for two samples submitted for electron microprobe analysis (EMPA) and 10 samples submitted for IVBA testing were similar between site and background samples, although total arsenic in site samples was higher (5.3 to 602 mg/kg) than in background samples (0.91 to 3.53 mg/kg). The soils were generally characterized as sands and gravels, with some additional silts and clays. Humic and fulvic substances ranged from 3.9 to 8.2 mg/L, with little difference between the background and site samples. Total organic carbon (TOC) ranged from 0.74 to 3.86% with most samples falling between 1 to 2% TOC. Soil pH ranged from 5.55 to 7.47. Arsenic is present as CCA, originally used as wood preservative for the wood fencing. The arsenate in CCA is a soluble form that has leached out of the wood over time and entered the soil matrix. Once in contact with the soil matrix, various chemical and physical reactions occur ultimately reducing bioavailability. The site and surroundings will only be used for ranching and occasional recreational uses. A human health risk assessment (HHRA) and ecological risk assessment (ERA) were conducted to enable transfer of the property from the Air Force back to the USFS. A hypothetical residential land use was evaluated as a proxy for unrestricted use. The focus of the ERA was to protect upland plants, soil invertebrates, birds, and mammals present within the fencing of each of the three sectors. The habitat within these sectors consists of herbaceous grasses and shrubs subject to regular grazing, and the surrounding habitat is predominantly juniper forest. Because natural and constructed wetlands (including vernal pools) are present in two sectors, a key aspect of the ERA was also the protection of plants found in these sensitive aquatic habitats. IVBA testing of 10 surface soil samples was performed by Dr. Nick Basta at Ohio State University in Columbus, Ohio, based on a simulated gastric fluid extraction procedure which mimics a gastric pH of 1.5 (the CAB method prior to its publication). Costs were about $200 per sample. Electron microprobe analysis (EMPA) of two surface soil samples was performed by Dr. John Drexler of University of Colorado at Boulder, Colorado, to analyze the chemical speciation of arsenic present in the site soils to identify the dominant form of arsenic present. Costs were approximately $500 per sample. The bioaccessibility estimate (%IVBA) ranged from 51% to 64% (mean of 58%). The IVBA analyses were used to develop a site-specific RBA value indicative of the potential for arsenic absorption in the gastro-intestinal tract for humans (its bioavailability) based on the form of arsenic present in site soils. Higher RBA estimates (closer to 100%) indicate a higher potential for arsenic absorption and exposure. The site-specific RBA estimate of 47.4% was used to develop site-specific arsenic risk-based concentrations (RBCs) for human receptors. This value was calculated using the mean IVBA estimate of 58% in the following literature-based equation based on in vitro to in vivo correlation for a combination of agricultural and mining soils: %RBA = 0.72 (%IVBA) + 5.64 (Bradham et al. 2011). The qualitative findings from the EMPA results indicated that the dominant form of arsenic was associated with manganese (III) oxyhydroxide (MnOOH), representing 98% of the relative arsenic mass. Similar iron oxide particles represented the remaining relative mass of arsenic. The MnOOH contained approximately 0.5% arsenic by weight and 2% copper by weight. The likely source for the arsenic was identified as a copper arsenate compound (consistent with site history), that, when weathered, released its arsenic and copper to be sorbed onto the MnOOH in the soil. Some of the particles of MnOOH are directly related (cemented) to organic (plant) material. Almost all of the arsenic in iron oxides and manganese oxides may be available for solubilization and may be considered bioaccessible. These qualitative findings were refined using IVBA. 11.9.5 How was Bioavailability Used to Reduce Uncertainty in the Risk Assessment? A value of 47.4% was used to develop the target concentrations for site soils by applying the %RBA to the ingestion portion of the back-calculated equation for direct contact with soil. The site-specific RBA is slightly lower than USEPA’s current default value of 60%. After applying the site-specific RBA to the oral ingestion exposure route, residential human health cleanup goals for arsenic that corresponded to the target cancer risk levels of 1 x 10-6, 1 x 10-5, and 1 x 10-4 were estimated at 1, 10, and 100 mg/kg of total inorganic arsenic, respectively. In comparison, site-specific background values for arsenic ranged from 1.88 to 3.22 mg/kg among the different soil types. 11.9.6 How Did Bioavailability Results Affect Site Decisions? The arsenic cleanup goals for human health, reflective of the site-specific RBA, demonstrated that arsenic exposure under a hypothetical residential scenario is not the driving risk pathway for the site, and cleanup ended up being based on protection of sensitive plant species (51 mg/kg). The estimated remediation volume and cost using HHRA cleanup goal for arsenic of 1 mg/kg based on the default RBA (60%) was 20,000 cubic yards and $15 million. The estimated cost of the RBA study was $27,000 total ($12,000 for sampling and analytical and $15,000 for risk assessor labor). The estimated remediation volume and cost using ecological cleanup goal of 51 mg/kg was 8,000 cubic yards and $8 million. Therefore, the Air Force spent $27,000 to reduce the expected remediation volume from 20,000 cubic yards to 8000 cubic yards, which equates to a total reduction in costs of approximately $7 million. A key regulatory challenge on the project originated from the different federal and state policies governing risk assessment. Specifically, new Air Force policy regarding risk assessment as of June 2015 dictates that risk assessments at Air Force Facilities in California no longer follow California State guidance in the cleanup of non-NPL facilities, particularly guidance relating to the choice of toxicity values and the cancer risk that may trigger a response action. The California agency’s request for the Air Force to calculate human health cleanup goals for the residential scenarios using both federal and state exposure and toxicity values to estimate risk was declined by the Air Force as it is contrary to the new policy. However, as part of the responses to state comments on the HHRA, arsenic cleanup goals for the residential scenario were estimated for target risk levels of 1 x 10-6, 1 x 10-5, and 1 x 10-4 using state exposure factors and toxicity values. These state-based cleanup goals were equivalent to or below the federal cleanup goal for arsenic based on a 1 x 10-4 target risk level and were also below the site-specific background concentration for arsenic. The state does not require cleanup to concentrations less than site-specific background, and use of the federal-based cleanup goals satisfied the state’s cleanup requirements consistent with unrestricted land use. Therefore, the state maintained a policy disagreement with the approach used to develop the human health risk assessment, but acknowledged that the proposed soil cleanup volume for the project based on the ecological cleanup goal (lower than the federal human health cleanup goal) meets the state’s acceptable risk management range for unrestricted land use and allowed the bioavailability-based decisions to stand. This decision allowed all agencies to agree that the selected remedy was protective of human health for this site and the reduced volume of excavation was used for execution of the feasibility study.